Sign up for Broadjam today to follow Josh Allan, and be notified when they upload new stuff or update their news! 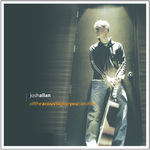 These are unreleased songs from the upcoming Josh Allan album, due out in 2006. Recorded over a period of almost a year with SoulThink producer/engineer J. Benjamin Kesler in St. Louis, Missouri, "All The Acoustic Pop You Can Drink" would quite accurately be called a labor of love. The concept for the album was born with the idea of blending the stripped acoustic guitar sound of organic folk-pop songs with the strong melodies and groove of R&B - and it's safe to say they achieved their goal. Josh Allan calls his music genre acoustic indie pop, and it's characterized by passionate vocals, distinctive piano melodies, and precise acoustic guitar riffs, citing influences like Simon & Garfunkel, Ben Folds, Damien Rice, John Mayer, and Billy Joel.